Flash drive recovery is the process getting back lost, deleted or formatted data from flash drives, which can be easily and safely done by recovery software. If you are troubled by flash drive data loss issue, you can try methods in this post. Nowadays USB flash drive has become one of the most widely used mobile storage devices. It is small in size and large in capacity, which brings great convenience to our life and work. USB flash drives are often used for the same purposes for which floppy disks or CD-ROMs were used, i.e., for storage, back-up and transfer of computer files. They are smaller, faster, have thousands of times more capacity, and are more durable and reliable. However, the risk of USB flash drive data loss is still inevitable. The file system of USB flash drive becomes RAW. Data loss will lead to unnecessary losses and troubles. To reduce the losses and avoid troubles, it’s a wise move to keep a piece of free USB flash drive recovery software for emergency. 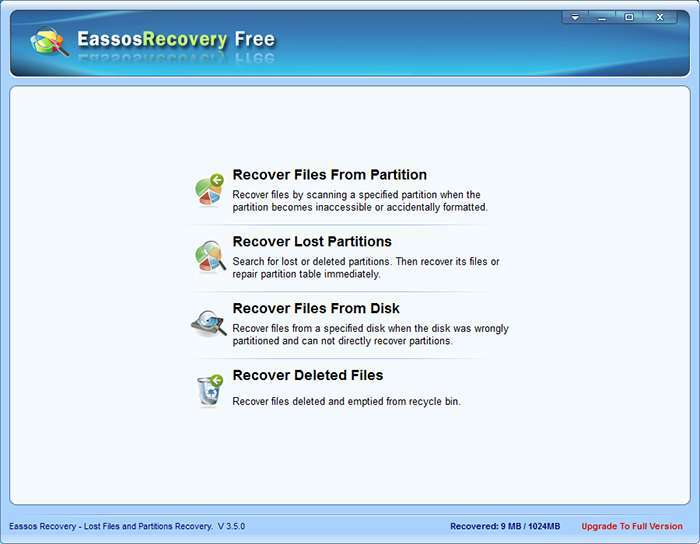 I would like to recommend Eassos Recovery Free for USB flash drive data recovery. It can solve almost all the USB flash drive data loss problems: recover deleted, formatted files, or lost files caused by virus attack, improper operations and other unknown reasons. Besides, it supports memory card data recovery, CF card data recovery, external hard drive data recovery, etc. How to recover lost / deleted files from flash drives with free recovery software? Step 1: Connect your flash drive into USB port of your computer and launch Eassos Recovery. Step 2: Choose proper recovery mode on the basis of data loss situation. For example, if you want to get back deleted files, then choose “Recover Deleted Files”. Step 3: Select the flash drive to start file scanning. Step 4: Preview recoverable files and get them recovered. This entry was posted in Data Recovery and tagged flash drive recovery, USB flash drive recovery software by EASSOS. Bookmark the permalink.